You don’t have to be pregnant to crave chocolate. Yes, I desired a daily dose of sweetness well before Peanut took up residence in my belly. Perhaps it’s hereditary? Because my mom is a fan of chocolate, too — especially chocolate of the dark and bitter variety. 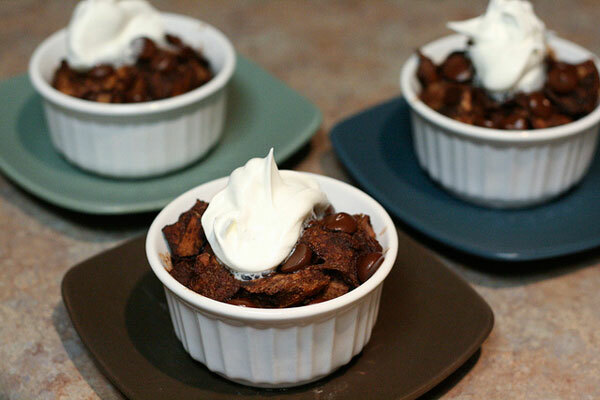 So what better dessert to make for her visit than dark chocolate bread pudding? These single serving size desserts can be prepared ahead of time and baked just before serving. Finish with a big dollop of whipped topping to balance the dark chocolate. Ooey gooey yummy. And you know dark chocolate is healthy, right? It’s high in antioxidants and rich in flavonol. Arrange bread cubes in a single layer on a baking sheet. Bake at 350° for 5 minutes, or until toasted. Combine milk and next 5 ingredients (through egg) in a medium bowl; stir well with a whisk. Add bread; toss gently to coat. Cover and chill for 30 minutes or up to 4 hours. Coat 4 ramekins with cooking spray, and scoop half of bread mixture evenly between them. Sprinkle evenly with half of chocolate. Divide remaining bread mixture between ramekins, and top with remaining chocolate. Place ramekins in an 8-inch square baking pan. Add 1 inch of hot water to pan. Bake for 35 minutes, or until set. Serve warm with whipped topping. 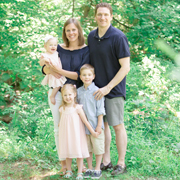 Bread pudding is one of Peter’s favorites, but I’ve never made it (not such a fan myself). This looks incredible, though! 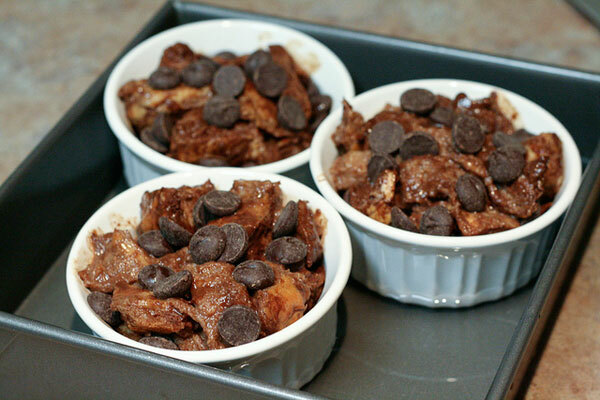 If anything could change my mind about bread pudding, I think this recipe would be it! Oh my. I LOVE chocolate bread pudding. I’m guessing your recipe is amazing, so I need to try it. 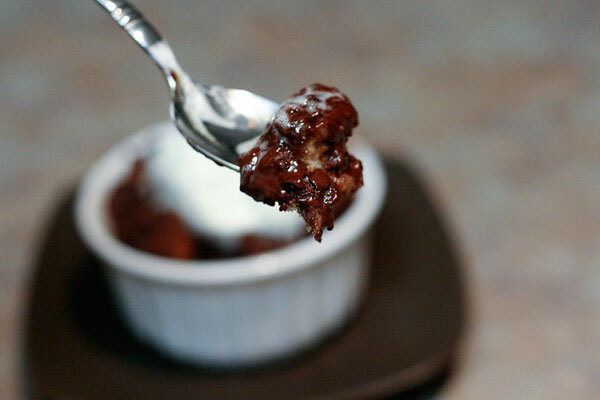 And you should probably try Williams and Sonoma’s chocolate bread pudding. It’s the bomb.